I bought a Nexus 5X in March last year and honestly it’s been the worst mobile phone I’ve owned. Despite having fairly good specs, it was incredibly slow in use and seemed to get slower with every major update. Anyway, I was using Chrome last night when the device suddenly froze. I thought it was the usual lag, but then the screen went black and then the Google logo appeared. It appeared to be a reboot, and I was immediately reminded of the well-known bootloop problems with the device and that I should probably make an up-to-date backup the next day. To my horror, the screen went black after showing the Google logo (instead of proceeding to the boot animation). I tried turning the device on again, but the same thing happened. Google logo, and then nothing. I then entered the bootloader menu by holding down the volume-down key while turning the device on. That worked. I selected the option to boot into recovery, but that did not work. What was interesting is that this is not a bootloop, it’s just a boot failure. I had a quick look online and found similar reports on Reddit and the Google Nexus forums (some in the past few days, and some explicitly mentioned using Chrome when it happened). I connected the device to a charger but it was also showing the Google logo and then shutting down, so (not wanting to make things worse) I unplugged it with the intention of seeing how it is in the morning. Unfortunately, in the morning, the device would not do anything. Apparently, the battery had drained even though the device seemed to be off. Connecting it to a charger yielded the flashing red LED, then the battery icon and then nothing. A bit later and it wasn’t even doing that. I have no idea if it is charging now, but I’m guessing not. I managed to get back into the bootloader menu once, but that’s it. It’s now pretty much dead. I bought the device from Argos and I thought I’d take it back to the shop to get it sorted out quickly. 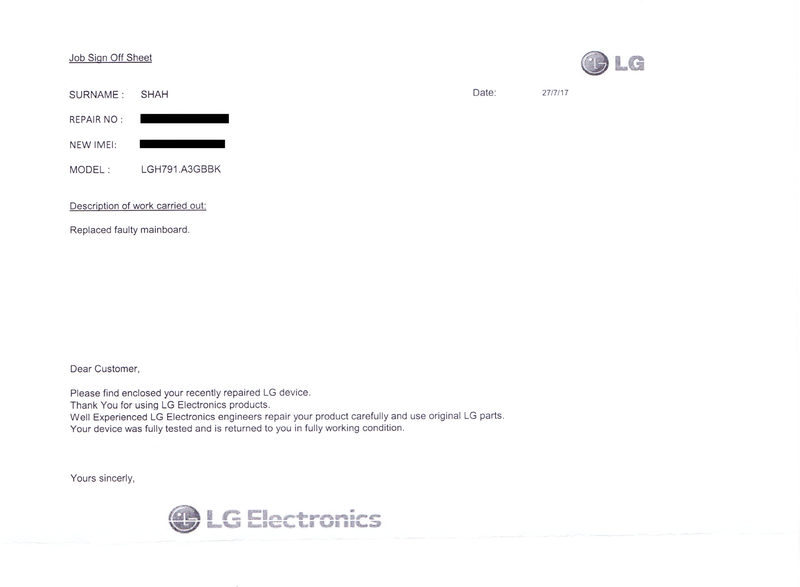 I explained that it’s a known fault with the device, it has a two-year warranty from LG and that my contract is with the retailer and I’m protected for up to six years under the Consumer Rights Act. They refused to help full stop, saying that they only offer a one-year warranty on the device and the Consumer Rights Act doesn’t apply to mobile phones (and only to items like kettles and toasters) and that I need to contact ‘Nexus’. I called Argos customer services by phone later, who were more reasonable, but said I need to get an independent engineer’s report. Which they can ask for under law, but I can only imagine it being a complete faff for a mobile phone and does not seem reasonable for a known fault and when there is still a manufacturer’s warranty in effect. I wanted the least hassle so I parked dealing with Argos and called LG next. They were pretty clued-up, and are sending me instructions to return the item to them for a repair using a locker-based service. However, it means I’ll be without the phone for two weeks which is obviously inconvenient. Anyway, the main lesson for me is do not buy a mobile phone or anything of value from Argos. They sold me an item with a major manufacturing defect, and essentially washed their hands of it. The fact is I’d have got better service from Amazon (I only bought it from Argos because it was a good price at the time). I’m now left with the task of sorting out access to online services I used which were protected by two-factor authentication, and also working out if I’ve lost anything important which was stored on the device. I’ve bought a temporary device to tide my over until I’m ready to buy a proper replacement, and I imagine I’ll just sell the repaired Nexus 5X once I get it back. My Nexus 5X has been repaired and is back and my possession. I haven't done much with it yet, but it's turning on and working normally so far. The device has a new IMEI and was (unsurprisingly) wiped. It's definitely the same device though (the screen protector that was on the device when I sent it in was still in place, for example).